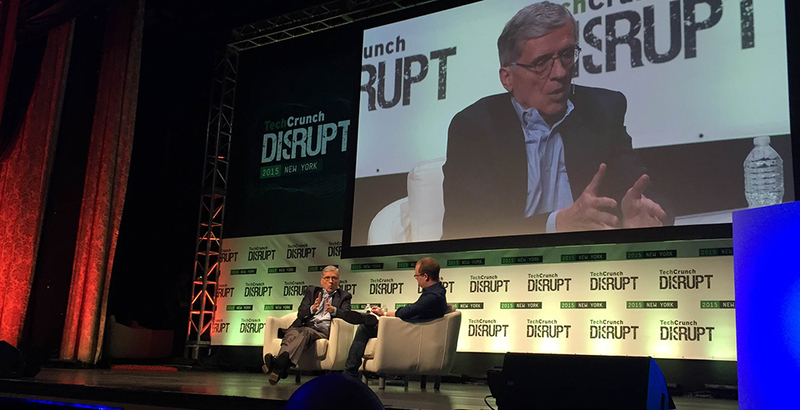 FCC Chairman Tom Wheeler speaking at the TechCrunch Disrupt conference on May 4, 2015. The collapse of the much-discussed, absolutely enormous Comcast/Time Warner Cable merger earlier this year might have been an occasion for consumers and consumer advocates to cheer — but for businesses, it was much less good news. Cable companies that want to buy other cable companies are kind of freaked out: what if the FCC is hostile to their plans, too? The advice to them from FCC chairman Tom Wheeler? Chill out: the FCC is not entirely anti-merger, and will review each case on its own merits. That’s what Bloomberg reports Wheeler told the top execs at TWC and Charter in a pair of phone calls this week, anyway. The news is almost certainly exactly what business leaders want to hear, as talks about cable mergers are still all the rage — and TWC is still considered a very attractive acquisition target. Not only is Charter still interested but also, Reuters reports today, French telecom firm Altice is interested in a bid. And apart from TWC, there is of course the still-pending DirecTV/AT&T merger, as well as lots of moving and shaking with smaller, regional companies as well. It should not necessarily have to be news, either to business leaders or to consumers, that a regulatory agency plans to do its job carefully each time it is asked, and to analyze each singular merger as a distinct entity on a case-by-case basis. And yet, here we are. That Wheeler called TWC and Charter specifically would seem to indicate that the Commission would not be as averse to that merger as they (and the rest of us) were to the idea of a combined TWC and Comcast. It’s not exactly an encouragement, but it does seem to imply that if Charter extends a second offer — and if TWC is inclined this time to accept — it seems likely that move would face less opposition all around than the TWC/Comcast deal did.